Temperature shifts, stronger and more frequent storms, drought, fire, and floods… We’re already seeing the effects of climate change manifested in many ways. These changes are placing critical habitats at risk, shifting ecosystems, reducing water supplies, creating health concerns, and generating significant economic costs. And they present significant challenges in terms of preparation, response, and mitigation. In the not too distant past we were at the mercy of these changes, and we handled them poorly. But by leveraging new tools and capabilities we’re in a better position than ever before to predict, prepare for, and respond to these changes. What does it take to address and mitigate these challenges, to become resilient? Here are four key GIS building blocks that form the framework. One of the key ingredients for resilience is to have access to the right data to gain understanding, to plan, and to act—data that represents the best of our knowledge, is reliable, and is authoritative. This essential data can’t be locked up and hidden on our servers; it needs to be discoverable and open. There are already many examples of community portals that provide access to great data. The Group on Earth Observations—GEOSS—is one such community, and Data.gov is another. Many others examples can be found and their numbers are growing as the task of creating open data portals becomes easier. 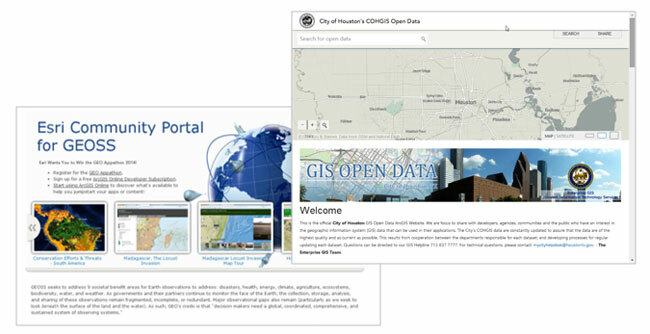 Esri recently released ArcGIS Open Data as a configurable part of every ArcGIS organization. This new capability will make it easier for all GIS organizations to make their data more open and available, and for anyone to find it. Along with opening up data, we also need to unlock the potential of that data—to tap into the knowledge contained within. This requires tools, best implemented as services, which can be applied to that data to leverage its intrinsic knowledge. Great tools can amplify and make “just data” more useful and valuable. But tools alone don’t make it possible to reach our intended audience; we also need to frame them in larger user experiences—as applications. These applications should be finely tuned to our intended users, whether that be scientists, GIS colleagues, decision makers, or the public. Examples of good tools that work against good data that are targeted to specific audiences effectively through applications include The Nature Conservancy’s Coastal Resilience 2.0, and the World Resources Institute’s Global Forest Watch-Commodities platform. To become resilient, we also need to open up communication and create awareness. We need to deliver information about important topics and issues, and most importantly begin conversations about them. And we can do that by telling stories with maps. Esri Story Maps are a very popular and effective way to communicate, and you’ve probably already made a few of your own. Story Maps combine interactive maps and multimedia—text, photos, videos, even 3D Web Scenes, and more—to create elegant user experiences. And they make it easy to use the power of maps to tell your stories. The essence of driving change, making better decisions, and becoming more resilient is rooted in collaboration. And when you apply GIS to that collaboration process, something powerful happens: you enable deeper understanding, and more informed decisions; you open minds, and open opportunities. GeoPlanner for ArcGIS provides a GIS-based platform to support all the steps of land-based planning. From project creation and data management to creating and evaluating scenarios and preparing project reports, you can manage all aspects of your planning process more efficiently and collaboratively by applying the principles of geodesign. As GIS practitioners we face many different challenges, and those brought on by climate change are among them. With a GIS framework built on access to great data, services and applications, communication, and collaboration, we now have available the tools and capabilities to meet these challenges and build a more resilient future.